“We have always been a band who has gained success despite having multiple singers…maybe we suffer from reverse ‘lead singer’s disease,” said C.J. Pierce. “Changing things up has not always been easy, but the band has become re-energized time and time again. We are looking to find a new singer who will give both us and, and most importantly our fans, the new adrenaline shot they deserve.” He went on to say, “We do wish Ryan great success in his future endeavors.” McCombs, who had been part of the band since 2006, replaced singer Jason Jones, who joined Drowning Pool following the tragic passing of Dave Williams. 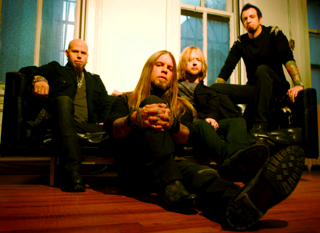 Drowning Pool turned the world into believers with their breakthrough single “Bodies” in 2001. Ten years, three singers and four albums later, they’re giving fans a new reason to believe. “Feel Like I Do,” the lead single from their self-titled fourth studio release [Eleven Seven Music], became the band’s biggest radio hit to date, reaching No. 2 at Active Rock Radio, and remaining in the Top 5 for 12-weeks. With 2009’s “37 Stitches” off of Full Circle reaching #4 at Active Rock and “Feel Like I Do,” the band had 2 consecutive Top 5 Active Rock smashes and cemented their place as one of the top hard rock acts today. The band’s sophomore album, Desensitized with second singer Jason Jones spawned a Top 10 hit with “Step Up.” Recent successes have paved the way for unique opportunities such as presenting the Lane Evans Mental Health Care Reform to then-senator Barack Obama on Capitol Hill, performing for our troops all over the world and partnering with organizations like The Wounded Warrior Project and the G.I. Film Festival. Drowning Pool is currently looking to find a suitable replacement for McCombs. In the meantime, they have already begun writing their 5th studio album in their hometown of Dallas. Drowning Pool is C.J. Pierce – guitar/ vocals, Stevie Benton – bass/vocals, and Mike Luce – drums/vocals. For more information on Drowning Pool, please visit: www.drowningpool.com.